Let’s Find Loving Homes For Your Art! Start with a Free Chat! You can ask me anything! Take a Few Minutes to Explore. There’s Good Information Here. And Good Vibes, Too! Do you wish you had a magic wand so people would just find you, love your art, and buy your art? Do you wonder if your website is doing the job it needs to do? Does “Marketing” sometimes feel like a foreign word? Are you putting off doing marketing because you don’t know if you can be effective? Do you have a cold email list? Are you fed up with Facebook? Keep on scrollin’ for instantly helpful information! Welcome to the Weekly Podcast! Each episode is short and full of inspiration and important takeaways that every artist will want to hear. There are also occasional in-depth conversations with artists or industry specialists. But the best part is this is where PDF’s, checklists, and other useful info will show up from time to time. I look forward to growing this community! Learn how to "Find Loving Homes for Your Art." You will find many dozens of articles to inspire you. They will set you on a path to mindful sharing and natural instinctual selling. They will help you find your authentic voice and selling your art becomes as natural as recommending your favorite book or restaurant. They were and still are the inspiration for the podcast. 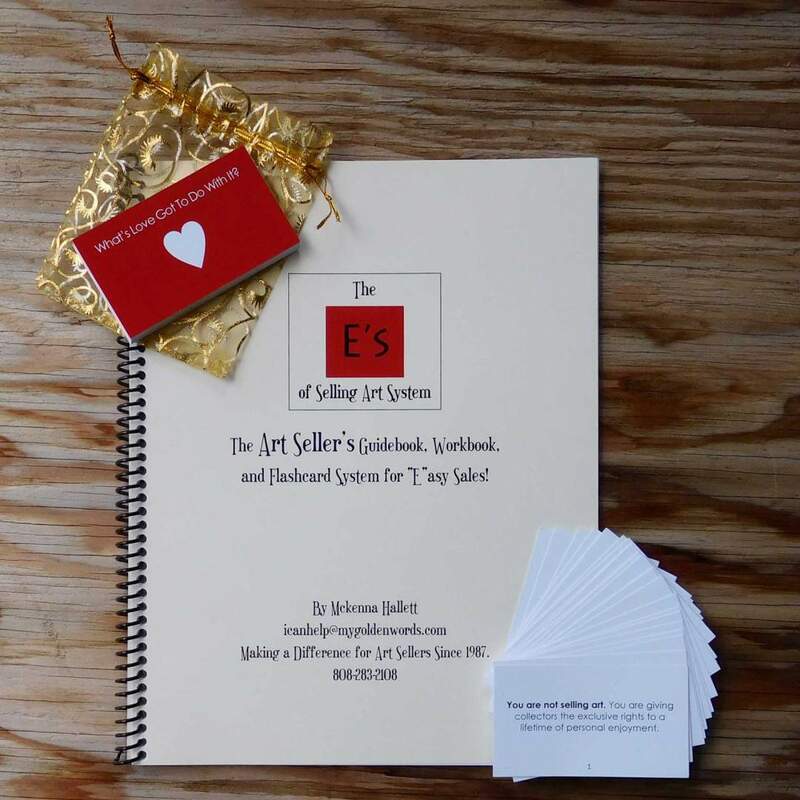 They are based on the “E’s of Selling Art System – Guidebook, Worksheets, and Indespensible Flashcards” which every artist should own, especially if you do live presentations at shows, your studio, or art openings. Five years and counting, the Marketing Articles include more than 200,000 words filled with information that any business can put to good use. In more recent times, I specifically help artists with the unique challenges faced in their marketing. The Curated Collection is a good starting point for anyone. Join my list and get an alert when the newest articles are published. Start with the Top Twelve Articles! Or go and read all the articles! Mckenna has real marketing skills - especially email marketing. Her insights into selling art both online and offline are very valuable to the art community. I never miss reading her blogs. I find her point-of-view to be enlightening, encouraging, and energizing. And very helpful, too. My sales have continued to grow with the help of Mckenna's terrific guidebook. If you do any face-to-face selling it is a must have tool. Mckenna is a jack-of-all-trades when it comes to her business consulting skills. She has helped me immensely to launch my hand-crafted business. I would be nowhere without her. Thanks so much for all your help with my emails. Every time we hit send, I have a very nice payday. Your words are truly golden.